Figure 6. Conversion of newly immortal p53(+) HMEC lines is associated with changes in many key properties. (A.B.) 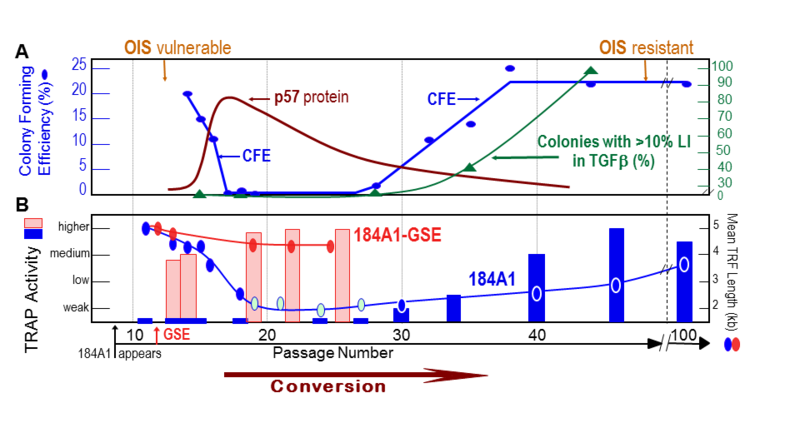 The p53(+) 184A1 line undergoing conversion exhibits changes in growth capacity (CFE) and expression of p57, expression of telomerase activity and mean TRF length, gains the ability to maintain growth in the presence of TGFb, and becomes resistant to OIS (8,21,50,56,61). When pre-conversion 184A1 is transduced with GSE22, there is a rapid increase in telomerase activity associated with stabilization of TRF length (8).